. : Onlinebase :|: Ontwikkeling :. Why Develop in ColdFusion 8? There is an increasing variety of opportunities in the world of ColdFusion development, fostered by the introduction of ColdFusion 8, and this is only likely to increase further with future versions of the platform from Adobe on the near horizon. 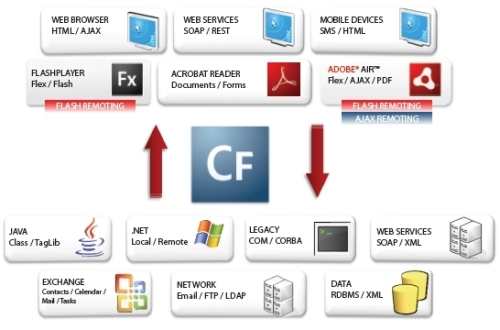 While Adobe ColdFusion software is widely used throughout a large majority of organizations today, the Java™ programming language is rapidly being considered or adopted in many of these organizations. As IT professionals investigate the use of ColdFusion versus Java, it is important to understand that ColdFusion is designed to be used in conjunction with Java, leveraging the powerful capabilities that the Java runtime offers while maintaining the hallmark benefits of rapid, low-cost development provided by ColdFusion. ColdFusion 8 provisions a platform for developers whereby they can focus on delivering feature-rich Internet applications with the knowledge that the product has been developed with security in mind. IRM's static source code analysis, coupled with creative scenario-based testing techniques, shows the security best practices that have been adopted during the development of ColdFusion 8. The J2EE configuration of Adobe ColdFusion 8 Enterprise Edition enables you to run multiple ColdFusion server instances on a single physical server. The result is an environment of highly available, more secure, performance-optimized applications. In the past, this would have required multiple copies of ColdFusion running on separate physical servers. ColdFusion 8 Enterprise Edition eliminates the need for and expense of additional hardware and software. Create more applications in less time with fewer lines of code — Develop applications more rapidly in the easy-to-use ColdFusion development environment, clearing your Internet application backlog. Reduce the lines of code in every application by encapsulating complex actions into simple, intuitive tags. Debug applications more easily and resolve bottlenecks quickly — See exactly what is happening in every application, identify and fix bottlenecks before deployment, and tune the server for better performance with the new ColdFusion Server Monitor. Set breakpoints, watch variables, and step through code, making it easier to debug code that does not run in a browser, such as CFCs, web services, and remote calls to Flex applications. Increase end-user productivity with richer, more robust applications — Create more powerful, easier-to-use applications than ever before. Let users go beyond simple HTML and experience personalized multimedia-rich applications developed in Adobe Flex or Ajax; interact with powerful PDF forms as well as HTML; view high-quality, on-demand presentations that include animation, audio, and video; and receive high-quality, structured business reports with more output choices. Smoothly integrate Internet applications with virtually any enterprise environment — Deploy ColdFusion 8 applications natively on leading J2EE application servers, including IBM WebSphere, BEA WebLogic, and JBoss. Integrate ColdFusion 8 applications with virtually any enterprise environment thanks to support for Java and .NET objects. Geplaatst op 29 december 2008 om 14:06 u.